Being one of the leading manufacturer and supplier of products for health-care industries, we offer the best range of Coat for our clientèle. Our range includes product such as Lab Pant, Half Sleeve Lab Coat, Apron and Full Sleeve Lab Coat. These are manufactured by our team of extremely talented designers with the use of best-in-class fabrics. Our offerings are light weighted, with best suited fitting are economical to the pockets of our customers. We are leading manufacturers and suppliers of a comprehensive range of Disposable Lab Coat that have been designed as per the predefined standards and availed to the customers at the most comprehensive and market leading price range. These are Disposable Non- woven Apron are fabricated with the help of spun bond polymer non-woven fabric and spun lace fabrics. These fabrics are preferred because of their light weighted nature. Our products have excellent in water repellent and air permeability resulting in providing comfort & dryness resulting in anti bacterial and anti fungal resistance. Backed by the profound experience of the market, we have been able to offer our valued clients with White Disposable Lab Coat. These are coats especially designed for to be used in Labs. Our full sleeves lab coats are light weighted made with disposable plastics. 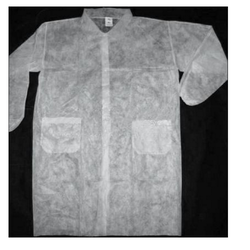 These sleeves coats are used in labs to secure the person wearing these coats from any chemical spills. Our esteemed customers can avail at a very low cost. 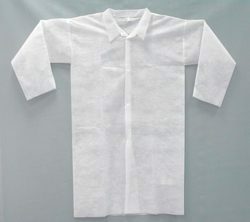 Looking for Coat apron for Pharma use ?